Take your best shot with our safe Nerf Ball Blaster. Try to hit the magical and mystical floating balls down as they spin, dip, and swirl around, making it an extra challenge to knock them off their lofty perch. This game is 12� wide by 12� long and 12� tall. The HoverBall game is enclosed with netting on three sides to keep all the spectators safe. This game is suitable for all ages, and will be a hit at your next event. 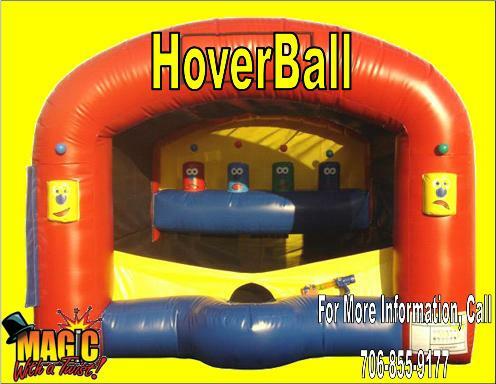 HoverBall requires a relatively flat area about 15� x 15� and within 100' of an electrical outlet. We prefer to set the inflatable up on grass. Please make sure all sticks, rocks and dog waste are cleared from the area before we arrive, to avoid delay in setting up for your event.